Working on an XML document, for having additional code assistance such as error highlighting or completion, you need to specify an XML schema (e.g. XSD or DTD). In the previous versions of IntelliJ IDEA, you had to work with Schemas and DTDs section in Settings or fetch schema from external resource with help of Fetch External Resource intention. IntelliJ IDEA 12 Leda introduces new way to configure schema for your XML file, based on detecting schemas located locally in project sources or libraries. 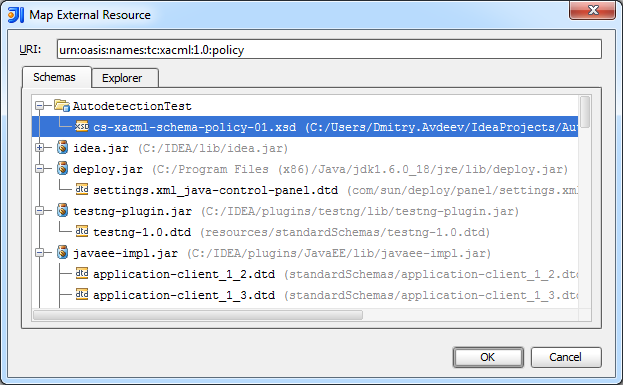 The IDE tries to match schema by information available in the document, including namespace, system id, etc. If auto-detection fails for some reason, you can adjust the schema with Manually Setup External Resources intention. This action shows the dialog with a list of all schemas found in your project. Now you don’t need to browse folders and jars to find schema manually. You can try this feature now in IntelliJ IDEA 12 EAP. Please feel free to give us feedback in comments here or submit bug reports in our issue tracker. This entry was posted in New Features and tagged Leda, XML. Bookmark the permalink.